De La Salle Harty have played their first challenge on Sept 5th against Ard Scoil Rís in Golden. Our 2019 joint captains are Cormac Power and Conor Ryan. We played 29 players in the challenge game that was competitive and a good start to our campaign this year which kicks off on October 17th v St Flannans of Ennis. 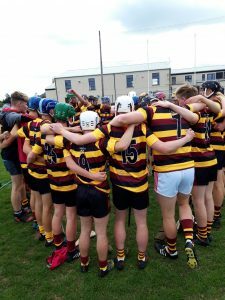 We have a number of clubs involved – Ballygunner, Roanmore, Mt Sion , De La Salle, Erins Own, Passage East, Mooncoin, Ballyduff Lower and Butlerstown. The management team are Dermot Dooley, Jonathan O Mordha and Marie Meagher. Our strength and conditioning coach is Gary Walsh of Waterford Warriors. We look forward to our next challenge game v st. Colmans next week. The players wanted to support Touching Hearts by printing and displaying the logo on the back of the jersey. It’s a charity that was set up to build a new early intervention centre for children between 0-6 years with additional needs. The centre also offers respite for families through aftercare and the project is ongoing.